Born in Stoke-on-Trent, England, Mark is the son and grandson of directors of Spode, the fine china manufacturers. 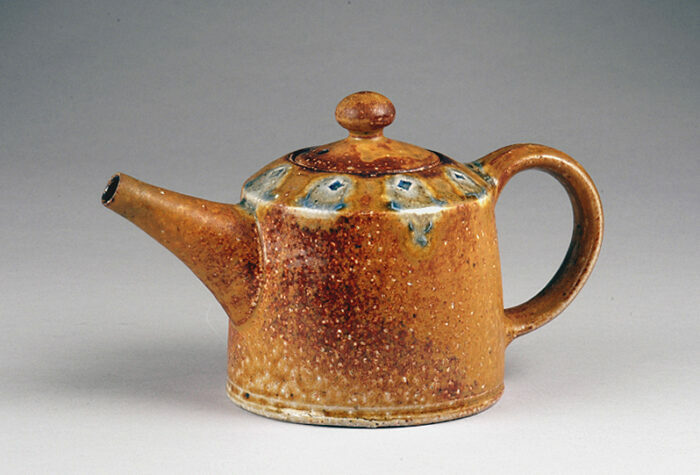 As a student at Bristol University in the early 1970′s, Mark read Bernard Leach’s “A Potter’s Book,” and decided to become a studio potter rather than an industrial manager. This decision led to a three-year apprenticeship with Michael Cardew, and later another with Todd Piker in Connecticut, where Mark met his wife, Carol. In 1983 they moved to Pittsboro NC and set up their pottery. Mark built a very large wood kiln and began making the distinctive functional pots for which he is known, specializing in very large planters and jars, along with finely made smaller items. He uses local clays and blends the different North Carolinian folk traditions together into a contemporary style that has attracted a sizeable following. — bio from Mark Hewitt’s website.